From the trusted house of Honeywell comes another nourishing opportunity for the family to enjoy meal time…introducing a meal that is more than just a meal-Honeywell Wheat Meal. Since it stormed the market in 2009, Honeywell Wheat Meal has proven to be a nutritious ball food meal to be enjoyed by everyone. Sourced from premium world class wheat, Honeywell Wheat Meal contains 100% wheat and is produced under international milling standards. 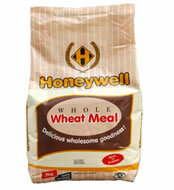 This implies that consumers are assured that Honeywell Wheat Meal is milled under extremely hygienic conditions. Honeywell Wheat Meal can also be eaten anytime of the day with any soup and is available in 1kg, 2kg, 5kg and 10kg sizes for the shopping convenience of our consumers. MINERAL CONTENTS : Contains Manganese, Phosphorus, Magnesium and Selenium in very large quantity. Rich in Zinc, Copper, Iron and Potassium. Calcium is also present but in small quantities. VITAMIN CONTENTS : Rich in Vitamin B6, Niacin, Thiamin, Folate, Riboflavin and Pantothenic Acid. Vitamin E and Vitamin K are also present. CALORIC CONTENT : Being made from 100% whole wheat which is a grain, it is very appropriate in calories. Increases the overall value and span of life.